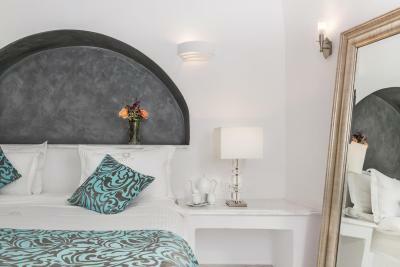 Lock in a great price for Anteliz Suites – rated 9.5 by recent guests! Views of the caldera are magnificent. Breakfast on the terrace is superb, delicious, magical. Staff is extremely personable, warm, helpful. 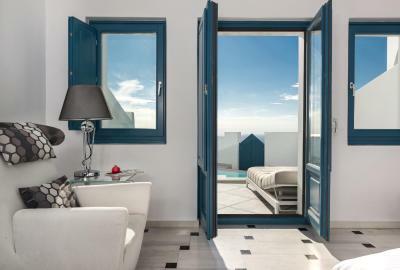 Location is perfect... short walk to Fira for eating and shopping... the other way for fantastic restaurants. It really was amazing and the staff could not have been better. 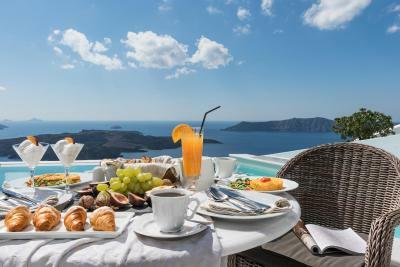 Having the option of breakfast in my room or on the pool patio was great. The staff did everything they could to make our stay amazing. 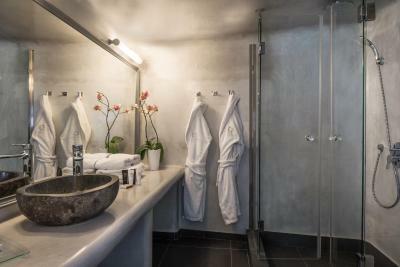 This boutique hotel is worth every penny. 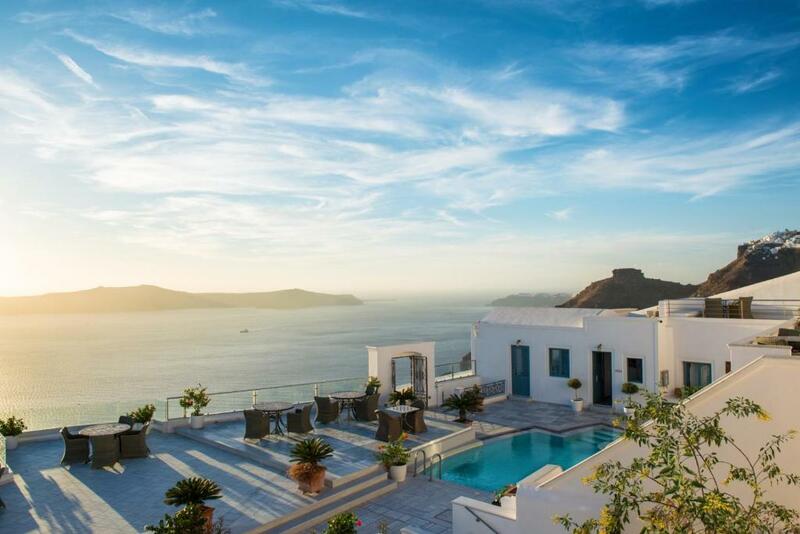 The view is one of the best in Santorini! The staff works like a private concierge service to assure you have a memorable trip. The pool and baths are very clean and inviting. A fabulous trip! This hotel is amazing. The staff was extremely kind and attentive. We stayed in the suite that accomated our family of 4. It was spacious and incredibly beautiful. I would highly recommend staying here! Excellent service,the view is amazing and you can’t get tired of it. The location was excellent and the staff were incredible. I would highly recommend. The location of this modern hotel is perfect. 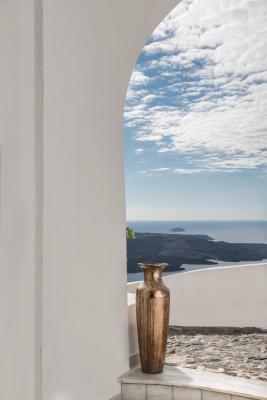 It is right long the Caldera and a short walk to Fira. The staff was truly exceptional. 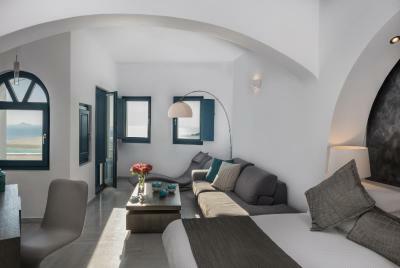 Santorini is a magical place and the Anteliz Suites makes the experience even more special. 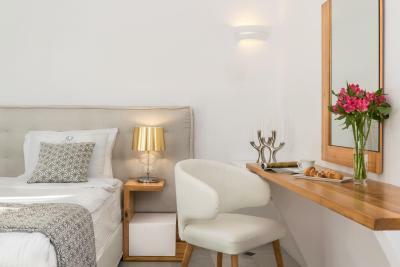 Anteliz Suites This rating is a reflection of how the property compares to the industry standard when it comes to price, facilities and services available. It's based on a self-evaluation by the property. Use this rating to help choose your stay! 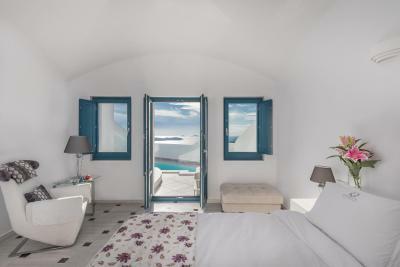 One of our top picks in Fira.Lying at the edge of the hillside of Fira, Anteliz Suites features an outdoor swimming pool with an open-air hydro-massage tub. 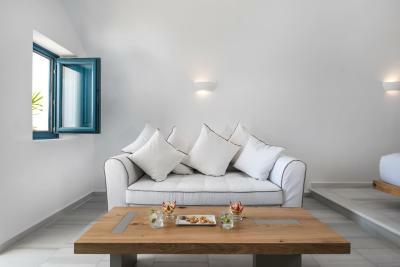 Its air-conditioned rooms feature a free plasma TV and free Wi-Fi access. Breakfast is served daily at the terrace by the pool. Anteliz rooms are tastefully decorated in accordance with the Santorinian architecture. 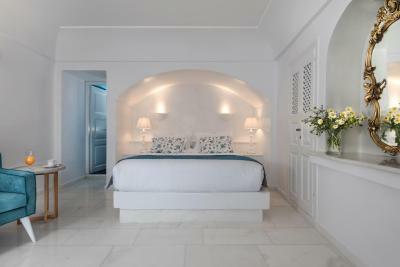 Each features all-white marble floors and bathrooms. They include air conditioning, a safe and minibar. 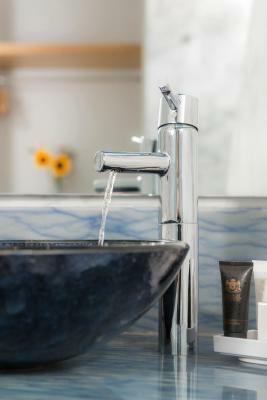 Modern touches include free Wi-Fi, flat-screen TV and iPod docking station. Hotel staff is at your disposal for restaurant reservations, car rental, wine tasting tours, boat trips to the Volcano or massage treatments. 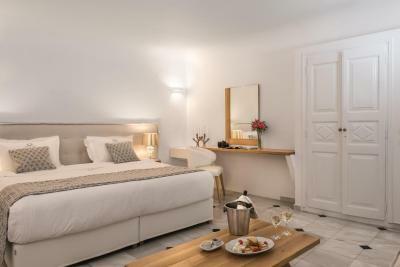 Anteliz is a 5 minute walk from Fira’s nightlife. 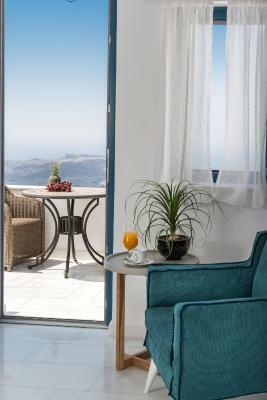 Santorini International Airport is a 15 minute drive away, while Athinios Port is reached with a 20 minute drive. Free public parking is available close by. 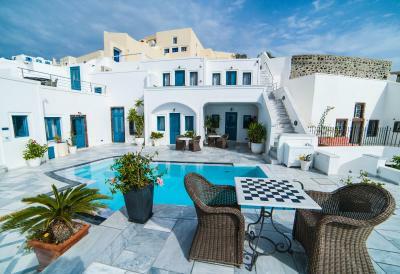 This property also has one of the top-rated locations in Fira! Guests are happier about it compared to other properties in the area. 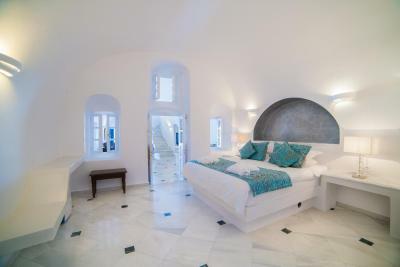 This property is also rated for the best value in Fira! Guests are getting more for their money when compared to other properties in this city. 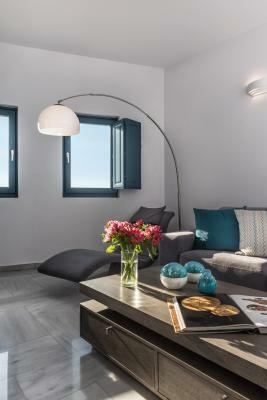 When would you like to stay at Anteliz Suites? 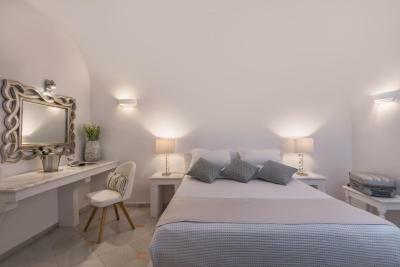 Double rooms are located on the pool terrace level, they feature traditional furnishings and view to the pool or the sea. 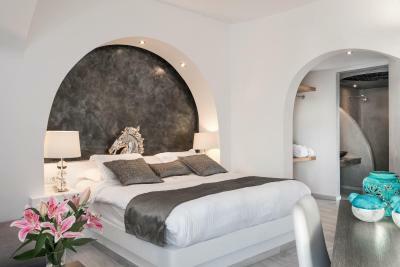 This volcano-view apartment includes a dining and a living area. 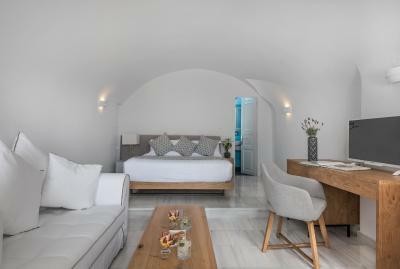 The Junior Suites feature a private balcony with panoramic view to the Caldera, the Volcano and the Aegean Sea. 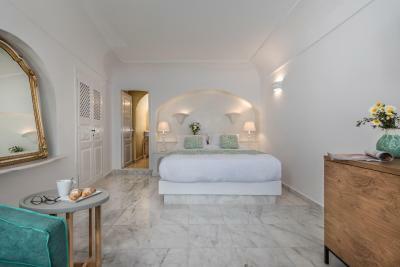 Decorated with white marble and hand-crafted wooden details, this spacious suite has a bedroom with king size bed and a living/dining area. 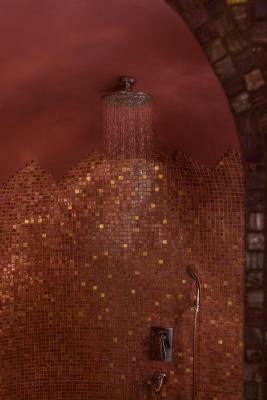 It has a bathroom with red mosaic tiles and rain shower. 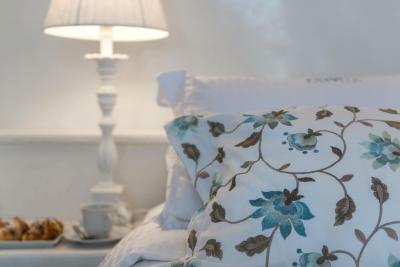 This spacious, tastefully decorated suite features 2 bathrooms, and a living/dining area. 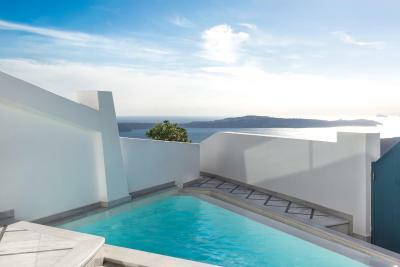 It offers a private terrace with panoramic view of the Caldera and the Aegean Sea. 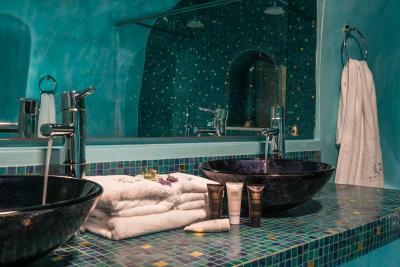 This suite features air conditioning, seating area and private pool. 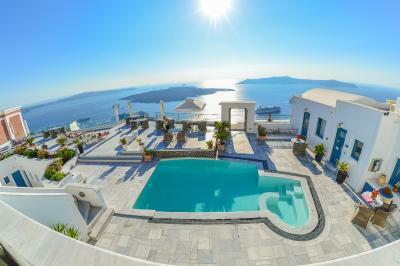 It offers a private terrace with panoramic view of the Caldera and the Aegean Sea. 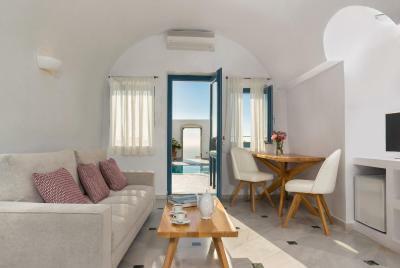 Featuring a balcony with sea views and a private whirlpool tub, this air-conditioned suite has a separate seating area and a flat-screen satellite TV. 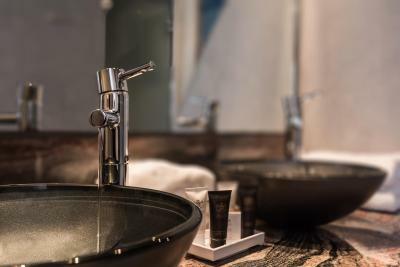 A mini-bar and a hairdryer are included. 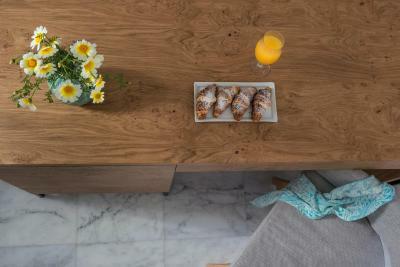 House Rules Anteliz Suites takes special requests – add in the next step! Children older than 15 years are welcome. Anteliz Suites accepts these cards and reserves the right to temporarily hold an amount prior to arrival. The water in the swimming pool was cold. Guess it's normal for Santorini in April! The attention of the staff was incredible. We also got a free upgrade to a bigger room. The breakfast was very nice. The Caldera view is incredible - in my opinion, we saw a much better sunset there than in Oia! 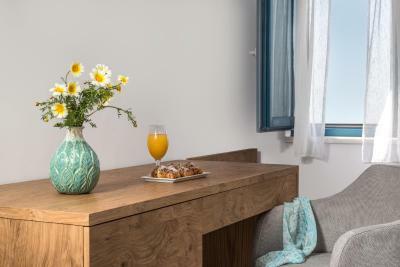 Location, rooms, superb staff. Antony, Veronica and Elizabeth were all really helpful and friendly. The pool wasn't heated. Our room was perfectly nice but it was quite basic which wasn't reflected in the photos of a standard double room. Beautiful property in a great location. The staff are so nice and helpful. It is super clean. Breakfast was really good. Not many negatives at all, really. When you ask for toast, you wont get toast you get bread or very lightly toasted so its crisp but not brown, that really needs to change. The only other thing was having only one key so we couldnt leave the aircon on for when we got back in the room. And staff came in and folded towels and clothes whenever we went out, we liked it but it was odd. From the moment we walked in we were greeted beautifully by the staff and we felt very special. The suite with the terrace was the most perfect place to stay. 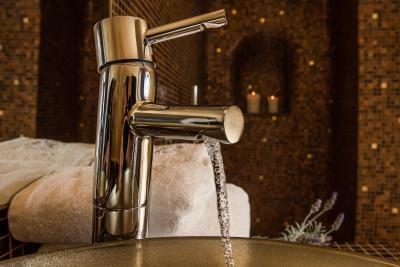 The bathrooms are superb with amazing pressure, the bed was very comfortable and the view was sensational. For the money we paid the experience was exactly what we hoped and more. 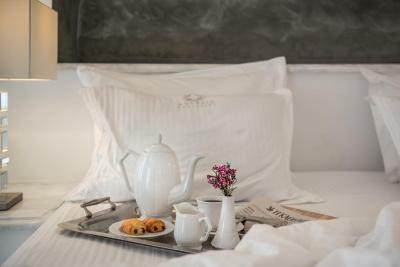 When we wanted boiled water we were given a tray with cups, teabags and a kettle and each time we left they came in and folded towels and clothes (odd but nice) it made us feel luxurious and thats what we wanted. 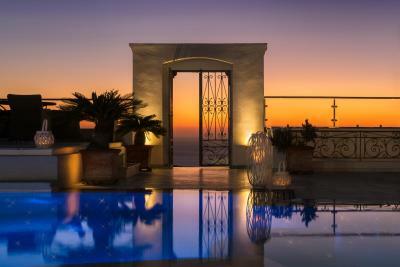 The location was great close enough to Fira but far enough that it was private and quiet. Breakfast on the terrace was great, the iced coffee was delicous. Staff were perfect. Aircon works really well and kicks in quickly. The pool suite would be good for those who would utilize the pool and who do not mind people looking in from the walking path. The jacuzzi on the balcony doesn’t have a heated option. 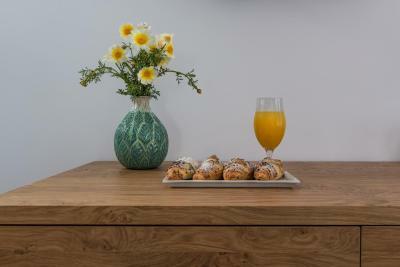 The Location is fabulous, the rooms are so large and spacious, the view is incredible, staff are so polite and happy to help with anything, breakfast is delicious! 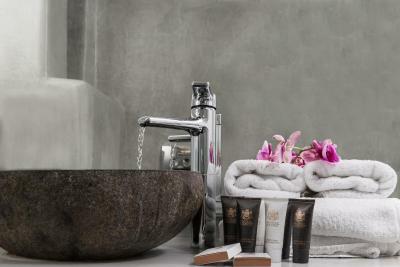 Very professional staff with exceptional clean rooms and central facilities! Extremely helpful and great location with unlimited blue!